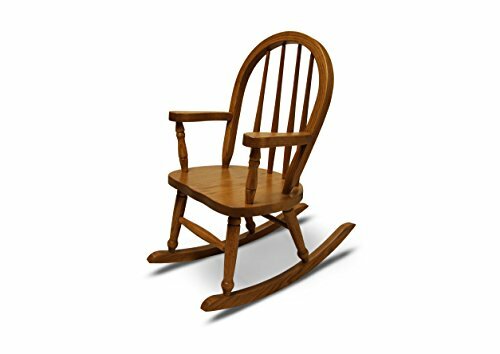 A simple yet elegant children's rocking chair, hand crafted from solid oak or cherry wood. Each chair is built, stained and finished by hand in America. Solid construction and durable clear coat will keep this chair in your family for generations to come. The chair comes completely assembled and ready for use. The seat is 12 inches high, and measures 11.5 inches from arm to arm. The total height is 27 inches, and the total width is 15 inches. Hand crafted from solid Oak and Cherry. Comes completely assembled, ready for use.